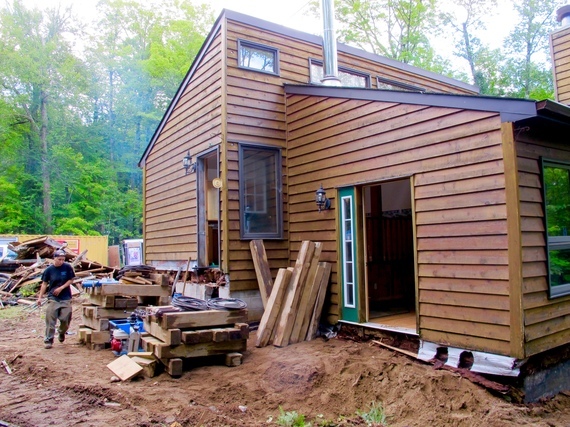 The average cottage weighs, according to Canadian house shifter John Purdy of Almaguin House Lifters, around 18 tonnes. Our new cottage, the ongoing subject of Colin and Justin's Cabin Pressure weighs more -- around twenty tons, in fact, give or take a few kilos. Expanding your cottage can be an uplifting experience, report Colin & Justin, especially if you want to add a extra full floor! But how does the master mover so precisely deliver this stat'? Simple: when his hydraulic lifting kit comes alive, it accurately weighs the subject property as it's cranked free of its earthly shackles. The weight info', indeed, allows John to accurately tailor his controls to make best of the lift and indeed all the associated machinery. And what machinery it is. With a control panel looking for all the world like the steam punked desk in Dr Who's Tardis, it's a joy to watch: all twinkling, sparkling knobs, and dazzling gizmos and buttons. If the machinery's master sounds familiar, that's because John Purdy is one of the country's most respected house movers. And besides it was he, along with business partner (and daughter) Andrea Purdy who performed a similar act of levitation during last year's Cabin Pressure 'slanty shanty' shift. But that was then. 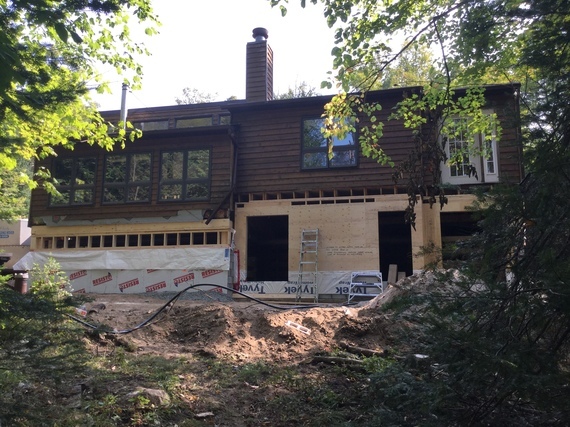 This year the process is even trickier: our latest cottage is spilt level and features a sunken living zone and a raised kitchen, bathroom and bedrooms. Aye, it's a difficult affair, but the father and daughter team undertook it with aplomb. See the entire process unravel on Sunday's show and watch in wonder as 20 tons of flooring, rafters, beams, pipework, wiring, framework and drywall creak and groan whilst being prized from the ground. Our lift emptied our sporrans by approximately 12K, but that, as we saw it, was a fair price being that it afforded sufficient headroom for a bathroom, a laundry, a family room, and a bedroom where once lay a dank, wet solum. First job, in our case? 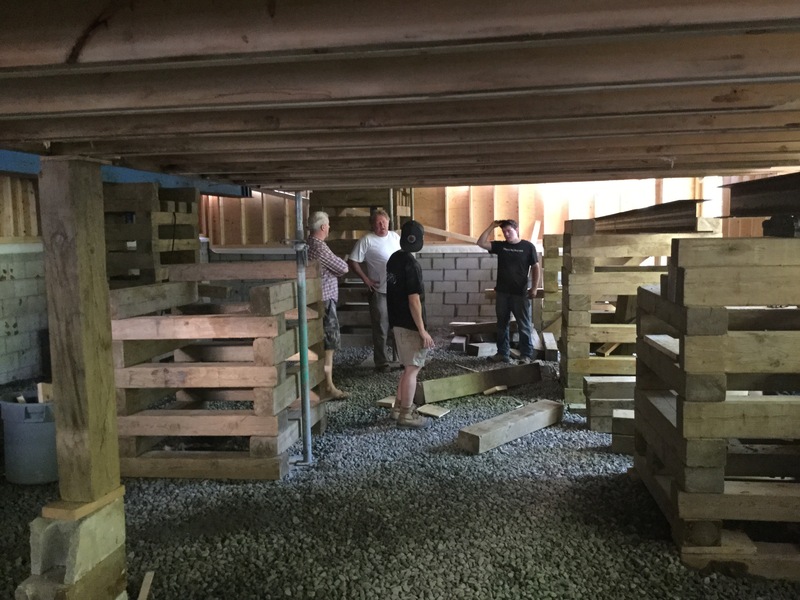 The excavation of 24" square apertures at each of our cottage's four corners, approximately two feet under floor joists into the brick walled crawl space. This done, the Purdeys inserted a matching pair of fifty feet steel beams. Imagine a classic rickshaw and think how two people holding supporting poles under the seat might raise its occupant from the ground. OK, this may be a naïve comparison, but it explains the way in which the jacking principle works. Very carefully (and very slowly) the beams (and our forlorn wee cabin) were hydraulically raised, inch-by-inch with a sequence of large timber blocks inserted to take the weight as elevation continued. Think Jenga, albeit on a HUGE scale. When the desired elevation was achieved (we opted for a nine feet basement so our downstairs guests would never feel second best) the process of building full height walls began. As did a program of works to repair the underside of our cabin. The problems uncovered? Many of our floor beams were rotten, degraded over time by ongoing moisture ingress caused by poor water barriers. And our rim joists had decayed to become little more than organic sludge. After these problems were fixed, John and Andrea returned to set their machinery into reverse and, over several hours, the cottage was carefully laid back down onto the newly heighted walls. 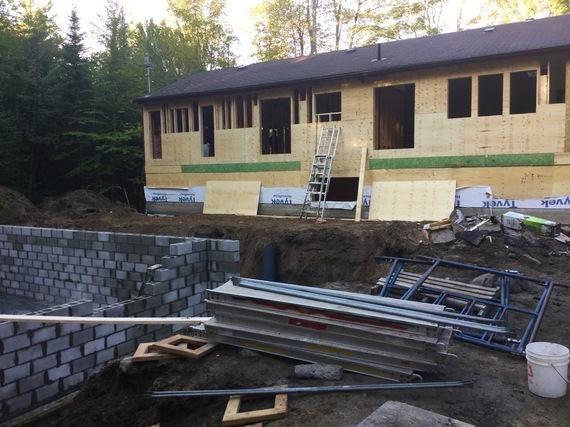 Over the subsequent days, Randy and his team re connected services and the house was declared ready for the next stage of its dramatic transformation. At last we could see the way forward. Scanning these images, however, we imagine it's hard to believe there'd soon be a whole new floor of luxurious, lower level living. In forthcoming weeks we'll lovingly unravel the entire story for your style hungry delectation. But we'll say this: everything that could go wrong did go wrong. Randy, fortunately, runs the site like a pro: nothing escapes his attention. Nor his remedial attentions. So bring on the bad weather, and a flood of almost biblical proportions that seriously undermined our project's completion. Cue power outages, lost and late deliveries, inter team clashes and a drama quotient to which the Kardashian family could only ever aspire. Yup, it's a seriously fraught project and one we shall never forget. Colin and Justin's Cabin Pressure airs on Cottage Life at 9 p.m. each Sunday. The network is currently in free preview. The rear view - ready to be clad, rewindowed and reroofed!